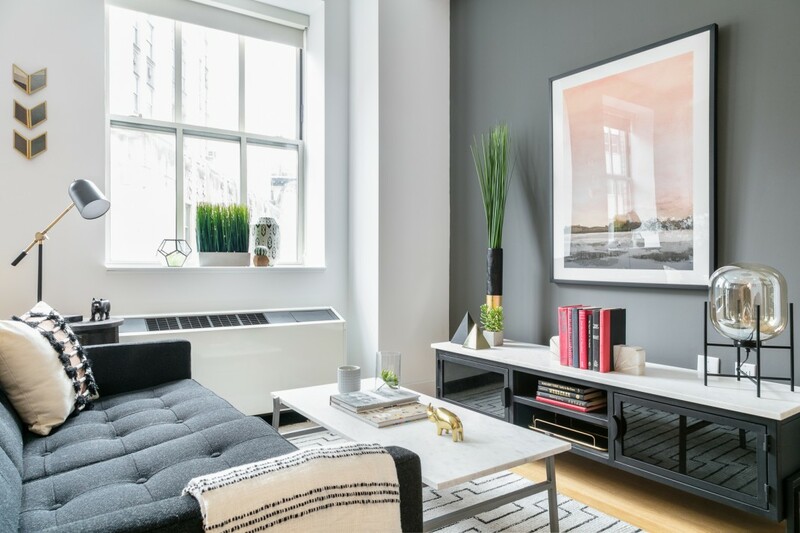 A model apartment at 63 Wall St. styled by Highlyann Krasnow of The Design High. 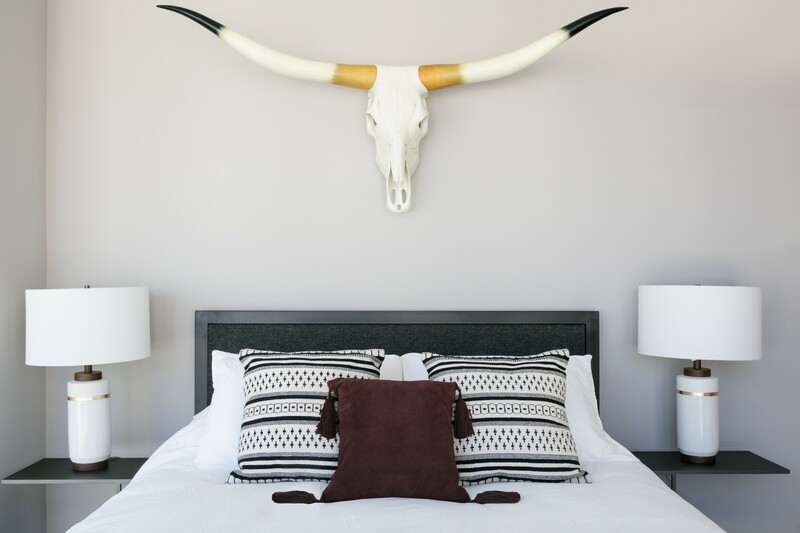 New York City interior designer Highlyann Krasnow is the founder and creative director of The Design High, the interior design arm of the real estate brokerage MNS. 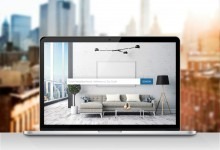 She has a few tricks up her sleeve when setting up a model apartment to make it feel open and serene—and make you want to buy or rent an apartment in the building. 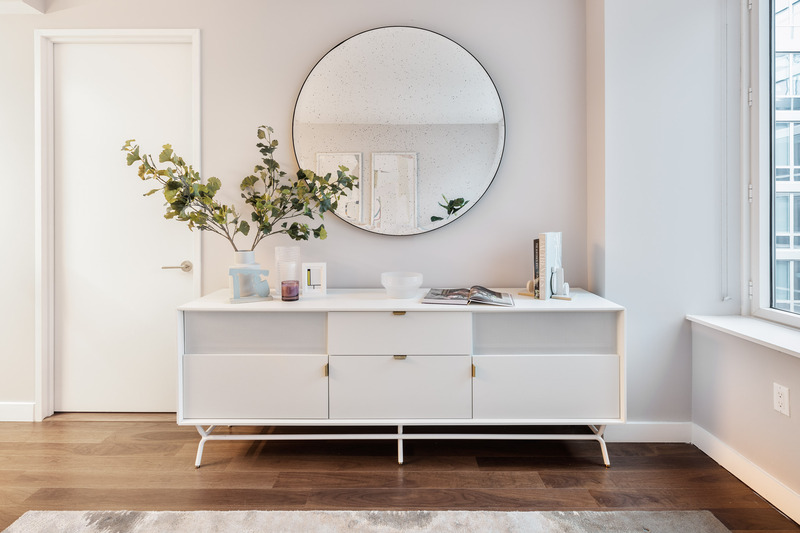 For this kind of project, Krasnow sources furniture from popular and (mostly) budget-friendly stores such as CB2, Blu Dot, West Elm, Wayfair, Joss & Main, and Organic Modernism, and websites including eBay and 1stdibs. She makes a point of placing items from different stores, as many as five or six, in the same room. 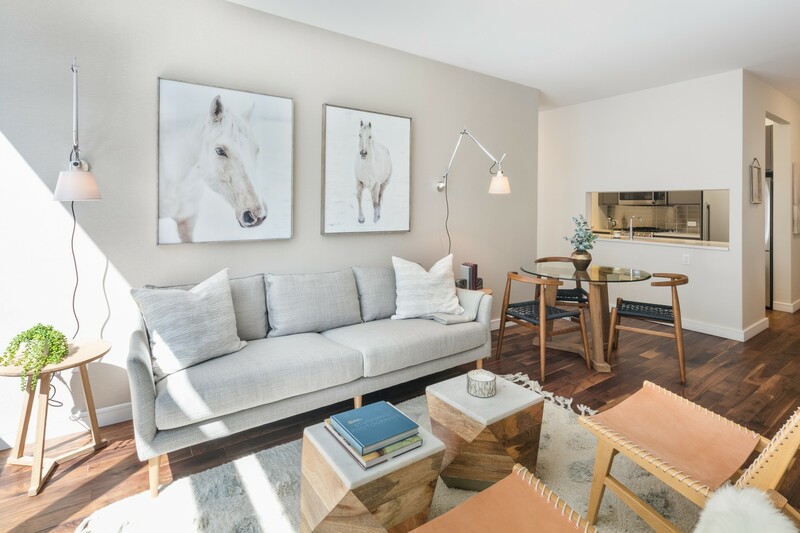 Her goal is to show renters or buyers how they can move into these buildings with their own pieces of furniture and add to them over time while retaining a cohesive look. “I don’t ever want it to feel like a catalog,” Krasnow says. "I want it to feel like a real home." 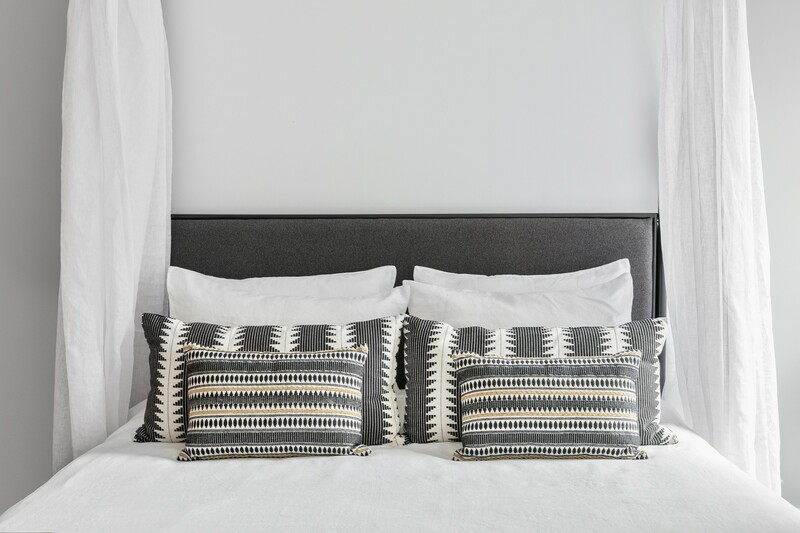 Here are more of Krasnow’s key design rules for giving your apartment a fresh, and possibly covetable look. 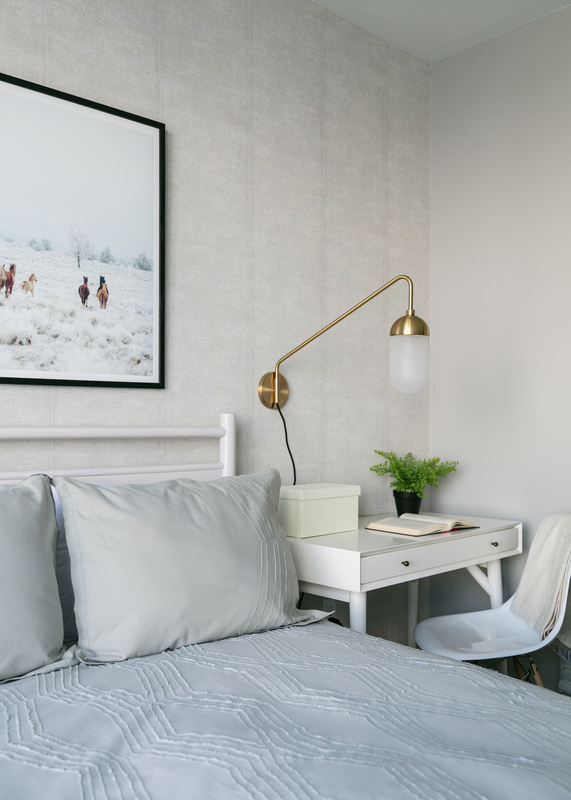 Krasnow thinks a big single statement piece on the wall is eye-catching and clean, as in this bedroom in a model apartment at 265 East Houston St. Small arrangements of multiple picture frames can look too cluttered, she says. “I love a gallery wall, but when a space is small, it can be overwhelming,” she says. In most model apartments, there are no TVs. For starters, they’re ugly. 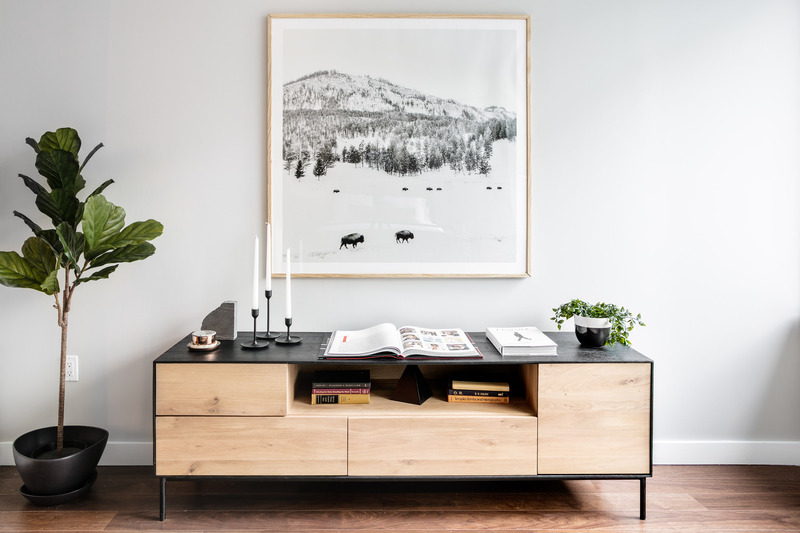 But you’ll still find the credenza, a slow-slung cabinet that’s great looking and good for storage. It's also a place where a TV could go, if you wanted one. Krasnow is finding that more and more people watch TV on their computers and opt not to have a set, so they don't necessarily have to be the focal point of the living room (also, even if they are, people touring apartments may not like to imagine their future selves huddled around the flat-screen watching a whole season of The West Wing in one go). Keep the credenza to put below the statement art instead, Krasnow recommends, like in this model apartment at the Level at 2 North Sixth Pl. in Williamsburg. Or add a TV if you must. At least it'll be on an elegant stand. In Krasnow’s model apartments, the lighting is typically on the walls. Table and floor lamps are rare. 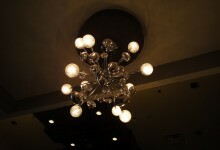 Sconces and swing-arm lighting, like this in a model apartment at 1614 Madison Ave,. are super helpful in a small apartment, Krasnow says. “You can’t use a table when there’s a huge lamp on it. It’s inefficient and you can’t direct the light where you need it,” she says. Neutral colors are timeless, Krasnow says. She uses color sparingly, and recommends reserving it for accent pieces like throw pillows that you can change out if you get sick of the color, as opposed to relying on a more expensive piece like a couch for that pop of color. That also goes for curtains and bedding: she uses a lot of white to create a neutral backdrop, including in a model bedroom at 63 Wall St., above. There’s always an animal picture in Krasnow's model rooms. It started out as a joke. “I always have a horse picture,” she says, as a nod to her days as an equestrian enthusiast. 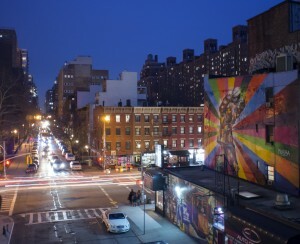 For example, see the white stallions in a model apartment at 507 West 28th St., above. These days, that theme has expanded to include all animals, and even mounted animal heads, but not the real thing. At least not yet. It’s a classic trick that’s been around forever. Having a large mirror on the wall to reflect light really does make a room feel larger, Krasnow says. 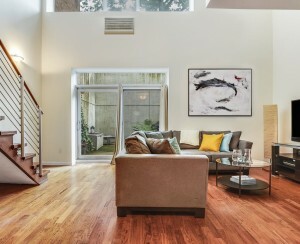 She used the technique in this apartment at 2 North Sixth Pl.